As the Earth rotates on its axis, objects in the night sky appear to move from East to West. Though this cannot be seen directly with the naked eye, it becomes very clear when watching the position of the stars over the course of an evening. This image is composed of 85 individual 30-second exposures which were processed into a single image to show the star trails over 1 hour 45 minutes. The trails in the image appear to be roughly straight, as it is looking towards the celestial equator, the part of the sky which is directly above the Earth’s equator. If the image was looking towards Polaris (the ‘Pole Star’), the trails would appear as arcs circling around the celestial pole. The image shows the differences in brightness and colour of different stars, something which can also be seen with the naked eye. Also visible in the image are a number of aircraft trails, visible as fainter dotted lines cutting across the star trails. The lights of a helicopter are also visible as a red curve at the bottom left of the image. The mountains in the image helped to provide the dark skies necessary for so many stars to be visible. The mountain peaks are illuminated by the moon which had just risen on the other side of the valley. The large gap in the trails was caused by having to pause to change the camera battery. 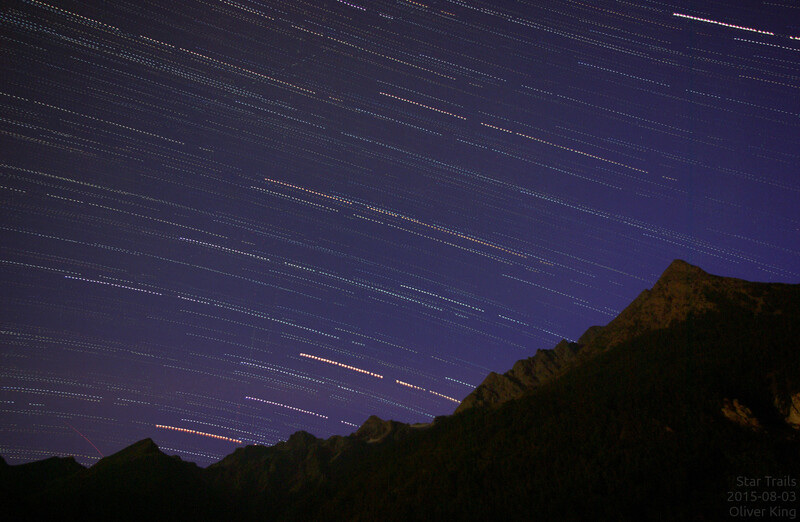 The video below is a time-lapse of the 85 exposures used to create the star trails image. The video shows the stars moving against the darkening sky. Also visible is the moonrise illuminating the mountains (about half way through the video) and then illuminating the hazy clouds blowing overhead.